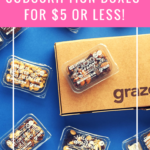 Check out the latest Morgans Coupon on My Subscription Addiction! 1 Day Left! Morgans Membership Offer – Join For $12, Get $24 in Credit! Morgans Membership Offer – Join For $12, Get $24 in Credit!